A popular decorating trend is to create a spa-like atmosphere in your bathroom by adding spa bathroom décor. You can achieve this look without spending a fortune on an entire bathroom renovation. The addition of a spa is a wise investment and will increase the resale value of your home. The first thing you need to decide is what style you want for your new spa design. The spa should appear as though it has always been there and is a natural flow from the master bedroom. The room should repeat many of the same design elements found in the bedroom while also introducing new ones. Next, you need to assess the space and decide what elements you can include in your design. You have an endless choice of colors, textures, designs and styles for a luxurious spa bathroom. The most difficult part will be narrowing your choices and making decisions. Select a design theme to help guide you in choosing paint colors and accessories. Southwest themed spas can be luxurious or have a rustic décor. You can create the feeling that you have traveled to an Arizona spa every time you enter you spa bathroom. Use any of the following combinations for a truly unique design. An English cottage has a cozy ambiance that is relaxed and perfect for a home spa bathroom. A high-backed bench or wicker chair can be inviting places to relax while your facial dries. You can purchase an old chair and table and create a distressed look to complete the cottage feel. Flowers are always associated with cottages so add an arrangement. You may decide a floral wall covering is the ideal wall treatment to convey an English garden. Contrast with stripes and you have the makings of a perfect nostalgic retreat. 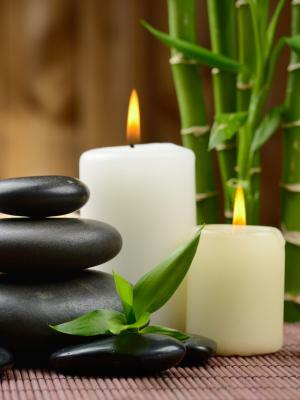 A Zen theme is one of the most popular choices for a home spa. This style lends itself to a setting of relaxation and clearing ground. 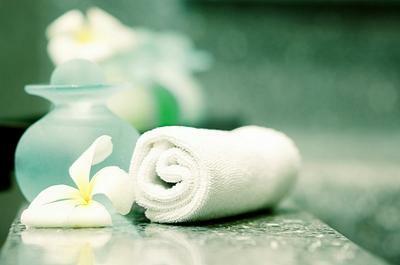 A Zen spa will help you to rejuvenate and contemplate while you rest. Burn incense, use soft lighting and complete the ambiance with meditative music playing in the background. One thing to keep in mind is the role color plays in creating a cozy and peaceful atmosphere. Give drab walls a splash of pale blue or rich green for a relaxing effect. You'll be surprised what a difference this will make as opposed to plain white walls. You can also add a couple of framed art prints on the wall to give depth to your design. Don't forget to carry your colors throughout your spa, repeating them in accessories, towels and scatter rugs. Quick, inexpensive changes can help your bathroom achieve the spa feel while some changes come with a bigger investment. If your budget doesn't allow for new cabinetry, consider staining or painting. Replace all of the cabinet pulls and if the hinges are showing wear, replace those as well. A new countertop in marble, quartz or granite will give your spa bathroom just the right touch of elegance. Replace any mismatched fixtures so there is a cohesive upscale feel. White or beige work well and don't limit you to a specific color palette. New bathroom fixtures will give a truly modern spa look. 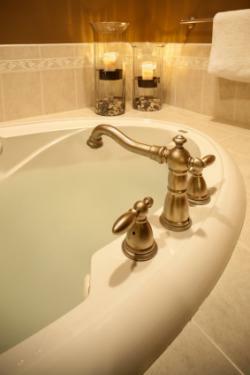 Invest in a spa tub to complete your new fixtures. An old shower head can be exchanged for rainfall shower head. Lighting is essential and can set the mood. Place lights on dimmer switches to ensure ambiance. Finally, splurge on a small crystal chandelier and suspend it over or near your new spa tub. Now that the main design elements have been completed, you want to turn your attention to the smaller details. Start by looking at window treatments. Blinds and shutters are excellent ways to control daylight and afford privacy. Shades can be used with draperies or curtains. Buy shelving to display and store your spa treatment products, towels and washcloths. Add some type of bathroom storage unit, such as a bathroom cabinet for storing extra washcloths, hand towels and bath towels. Instead of folding these items, try rolling them for a real spa feel. A great accessory is a bath caddy. Choose a wooden tray with compartments that fits over the top of your bathtub or opt for a stylized metal one. You can put whatever you want in the caddy, including items for a romantic bath for two, such as champagne and chocolate-covered strawberries or your favorite wine and cheese. Decorative soap dish and decorative soaps add a nice display by the sink. 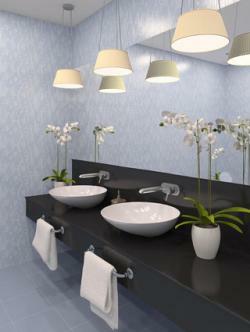 Elegant soap dispensers can hold liquid soap for daily use. You can also buy decorative soap dispensers for your shampoo and conditioner. Organic bamboo fiber towels are a great spa choice. Bamboo bath towels are extremely soft and naturally antimicrobial. This makes them hypoallergenic and odor resistant. You can also buy several bamboo fiber bathrobes and hang them from wooden pegs on the wall or on the back of the door. Use a clear glass vase and add polished river rocks with a sprig or two of bamboo. Add water and you have a nice spa-like display for your bathroom storage unit, windowsill or countertop. A shallow container can be filled with sand to hold a collection of seashells and some tea candles. Scented candles, oil diffuser with reeds or incense will give a nice aroma to your spa bathroom. A spa tub pillow is a necessity for true relaxation. A vanity stool, chair or chaise lounge is ideal if room allows. The final touches to your new bathroom oasis can be completed with spa baskets filled with self-indulging spa goodies. With the right accessories, it's easy to transform an ordinary bathroom into your own personal home spa. Just make sure the lock on your bathroom door works to avoid any unwanted interruptions when you're enjoying your spa escape.